A vital inhabitant of the Chesapeake Bay is the Virginia oyster (Crassostrea Virginica), also known as Eastern or Atlantic oysters. The oyster is designated as the state shell of Virginia. The decline of oysters in the bay is an issue that has generated an enormous interest from a variety of groups. Commercial harvests of Chesapeake Bay oysters have been carried out for over a century, reaching 4 million bushels annually in the 1920’s and continuing at rates that often exceeded 1 million bushels until oyster populations crashed in the 1980’s. Two diseases, MSX and dermo decimated bay oysters, contributing to their decline. Current oyster counts are said to be less than 1 percent of historical levels. In 2007, Maryland announced the formation of Maryland’s new Oyster Advisory Commission (OAC). The 21-member commission is tasked with developing new strategies for rebuilding and managing the Chesapeake Bay’s oyster population. The OAC consists of scientists, watermen, anglers, businessmen, economists, environmental advocates, and elected officials, appointed by the Maryland Department of Natural Resources (DNR). The Chesapeake Bay supports a successful oyster aquaculture industry. Small oyster aquaculture operations once consisted of areas of private property or leased beds where watermen maintained oyster bars which encouraged new oysters to colonize and grow. More recent aquaculture goes a step further to include seeded oysters that are grown in cages or bags to protect the oysters from damage. The Maryland Department of Natural Resources (DNR) and Virginia Marine Resources Commission regulate oyster aquaculture in the Chesapeake Bay. Shellfish aquaculture regulations prevent operations from infringing on private docks or waterfront properties. Oysters are prepared in many ways including single fried, oyster fritters, steamed oysters, oyster stuffing, oyster stew, and raw on the half shell. Chesapeake Bay oysters are available in the shell or shucked and oysters are on the menu of almost every restaurant on the region. A popular adage suggests that oysters should only be eaten in months that contain an “r”. Although modern technology allows producers to offer high quality oysters on a year round basis, there are a few valid reasons why the “r” month rule was developed. 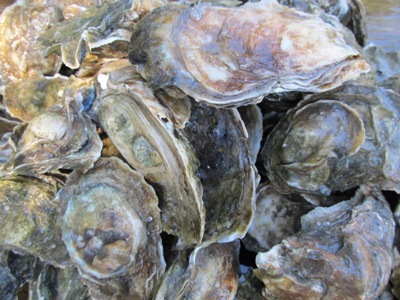 The “r” months of September thru April traditionally mark the period when wild Chesapeake Bay oysters are at their peak.